Lost in the recent news of RummellMunz's planned Southbank redevelopment, The District, is a detailed explanation of the proposed project's mix of uses. Here's a closer look at what the development group headed by Peter Rummell and Michael Munz have in store for downtown Jacksonville. The District - Well Lived will be developed on the 28.6-acre site of the former JEA Southside Generation Station. The project is being designed by Boston-based Elkus Manfredi Architects. Major urban developments designed by Elkus Manfredi include Downtown Disney, Miami Worldcenter and West Palm Beach’s Cityplace. Located in the Southbank, it will be accessible from Prudential Drive and Kings Avenue. 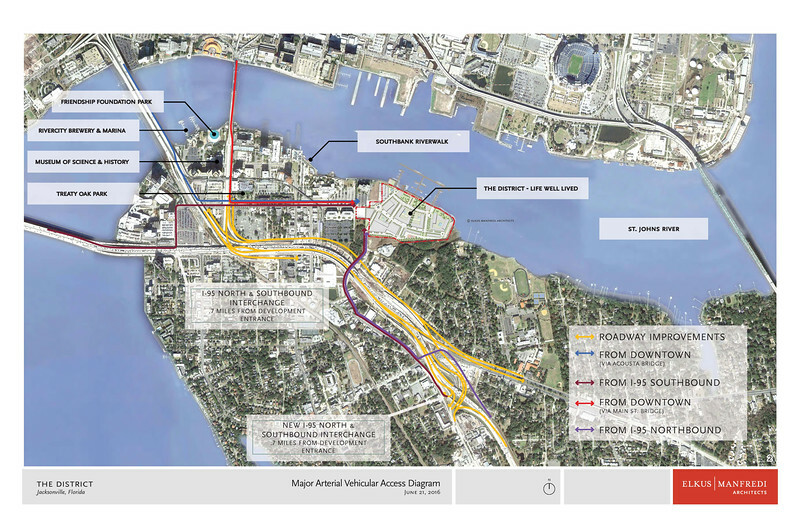 Access will be enhanced with the completion of the I-95 Overland Bridge project in 2017. This project will include a new full I-95 interchange where Kings Avenue, Atlantic Boulevard and Philips Highway meet. When complete, the three phase development will feature 1,200 multi-family residential units, 150,000 square feet of retail and 200,000 square feet of office space. Block 1A 14 story, 185’tall tower consisting of 6 floors of office space over 6 floors of parking and 39,100 square feet of street level restaurant/retail space. Block 2A 6 story, 75’ tall apartment building with 4 floors of residential over parking and 31,800 square feet of restaurant/retail space. Also includes 8 ground level townhouse units. Block 2B 13 story, 153’ tall apartment building with 8 floors of residential over 4 floors of parking and 11,700 square feet of restaurant/retail space. Also includes 16 townhouse units. Block 4A 17 story, 200’ tall mixed use tower with 12 floors of apartments, 4 floors of parking and a 10-screen cinema, 24,300-square foot grocery market and 14,000-square feet of retail at street level. Block 7A 20 floor, 230’ hotel/condominum tower and a 6,000 square foot restaurant along the river. Condominium units would take up the tower’s top 8 floors. 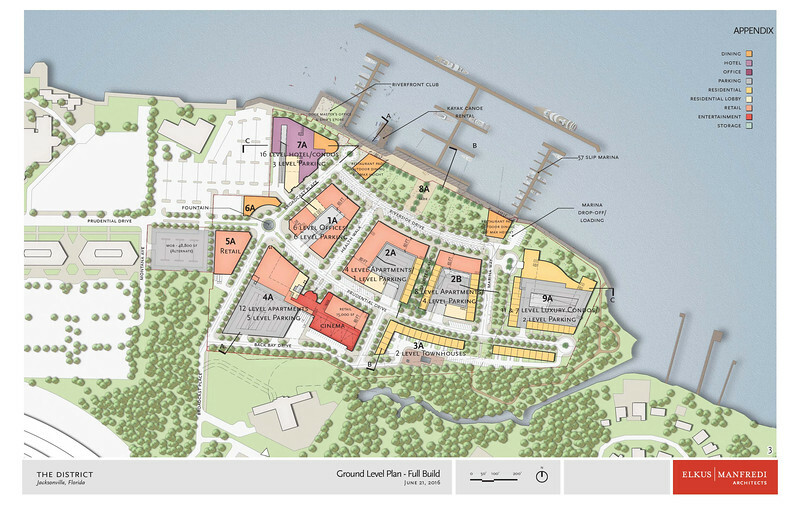 Block 8A A 4.5-acre public park, two restaurants with outdoor riverfront dining, 57 slip marina with kayak canoe rental and a riverfront club. Block 9A 12-story, 141’ tall and 8-story, 97’ tall luxury condominium buildings with 18 townhouse units at street level.